Upon completion of wave ?b?, we would fall in wave ?c?, which has minimum target of the wave ?a? low of 1280.80. 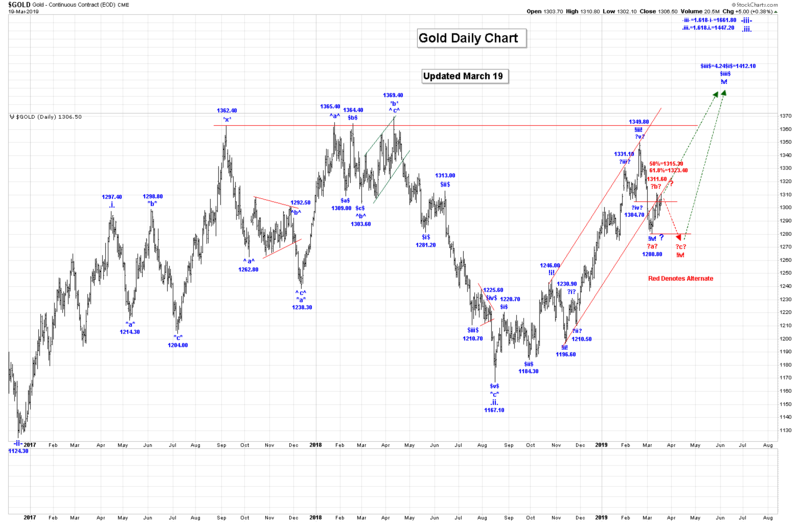 We have shown this alternate count in red on our “Daily Gold Chart”. Wave !iv! could also become a bullish triangle. Our preferred count is that wave !iv! is complete at the 1280.80 low! 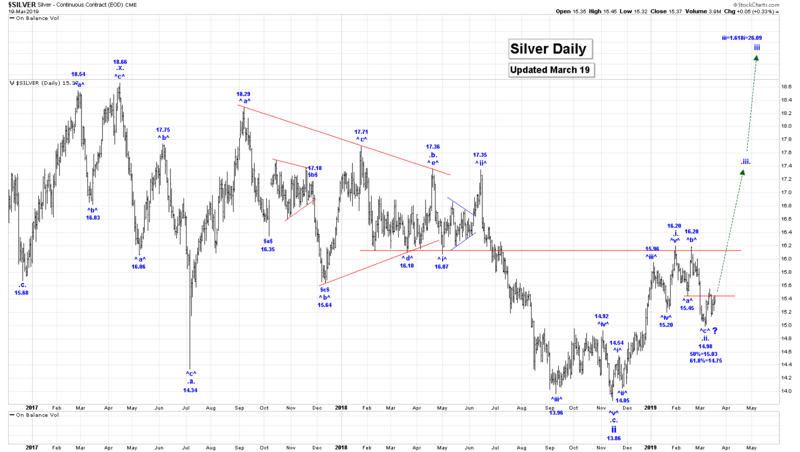 Silver needs to move higher now and close above the 15.55 high. Once wave .ii. ends we expect a very sharp rally in wave .iii. will be the next major event in this market. We will provide our initial projections for the end of wave .iii., when we are sure that all of wave .ii. is complete. Our preferred count is still suggesting that the SP500 should be heading to all time new highs in wave v of V, as shown on our daily and 120minute SP500 charts. We have updated our count within wave v to suggest that wave (iii) ended at the 2813.49 high and all of wave (iv) at the 2722.27 low. Within wave (v) all or most of wave -i- is likely complete, or almost complete at the 2835.41 high and if that is the case then we should expect a drop in wave -ii- to start very soon as shown on the 120minute SP500 chart. Note the possible ending diagonal triangle that is visible on the 120minute SP500 chart, which might be indicating that the end of wave -i- is close. We also now need to consider that wave V did end at the 2929.86 high and that we are falling in a new multi-year bear market. 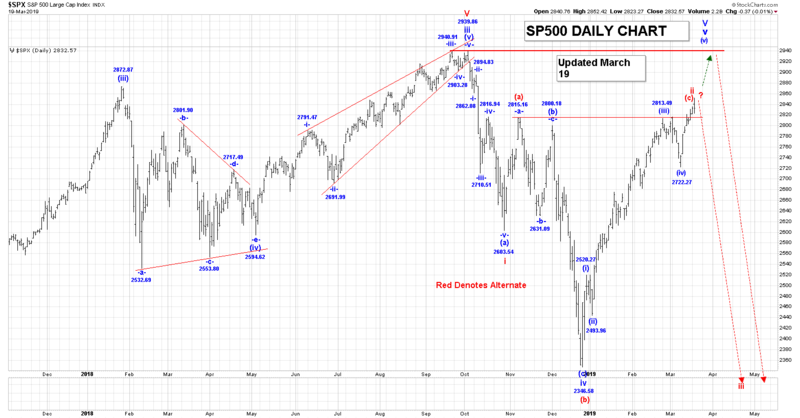 As you can see on the daily SP500 chart we have shown our red alternate count that suggested at wave ii was a very unusual looking irregular type correction that completed its minimum requirements at the 2821.24 high. A drop below the 2722.27 low now would likely confirm this bearish count to be correct. 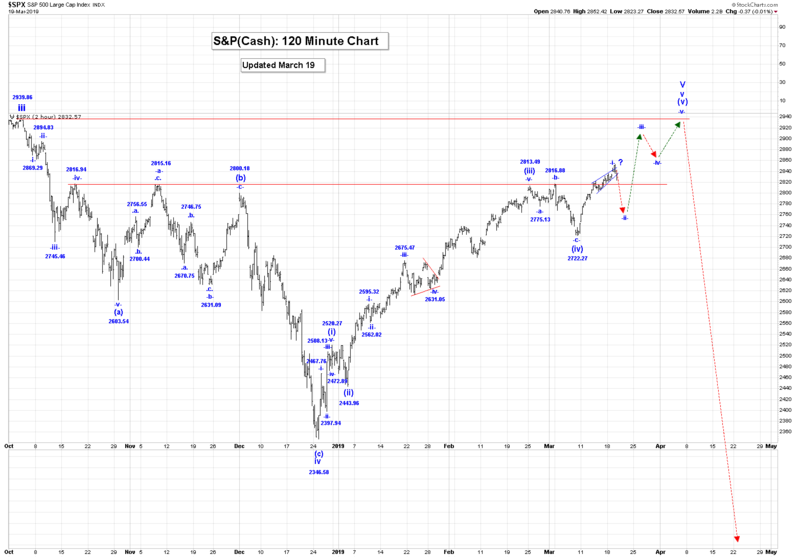 If this count is correct we should expect the SP500 to collapse in wave iii. Our ultimate minimum target for the end of wave (v), v and V is the 2929.86 high. Trading Recommendation: Stay short with a call option as a stop. Traders playing the Captain’s wave counts to new SPX highs via SPXL-nyse could sell now, before the Wednesday Fed announcement. Active Positions: Very short, with an updated call as a stop! Free Offer For Website Readers: Please send me an Email to admin@captainewave.com and I’ll send you our key “GDX Is On The Move!” report. I include key wave counts for the 60 minute chart, daily chart, and weekly chart, with tactics to help investors make money!